Who are the people in your neighborhood? Discover the best spots where you can chill, dine and train in Paseo de Roxas, Makati City. In this day and age where everything is “virtual“, the importance of an office’s location is still not lost to business owners, at least not to the savvy ones. They know that being in a strategic business location is advantageous to their entrepreneurial venture. Arch Offices is fortunate to have found an ideal location to set up its office space – Paseo, in Makati City. There’s a thriving business community, a nice urban and peaceful vibe, and you can find essentially anything you need a stone’s throw away. Convenience is king here! It’s no surprise businesses are scouring for a space in this bustling side of the city. You’d truly feel on top of the world when you dine at Top of the Citi by Chef Jessie. Known as a high-end restaurant with a perfect view of the Makati skyline, Top of the Citi specializes in European, American, and Asian cuisines. Want a healthy dish to start your meal? Try the Seared Tuna Salad in Wasabi Vinaigrette Dressing. 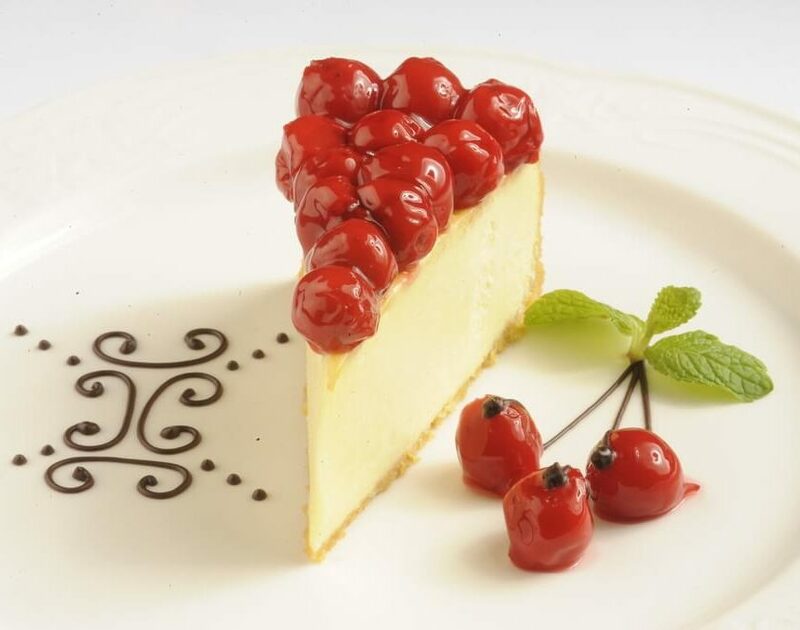 Then have the Pan-fried Chilean Sea Bass with Goose Liver for your main entree, and finish off your fine dining experience by satisfying your sweet tooth with Chef Jessie’s signature dessert – Baked Cheesecake with Cherries. Blackbird is a contemporary European and Asian restaurant headed by Chef Colin Mackay (of Sala Bistro and People’s Palace). As the name suggests, the place is aviation-themed since it was named after the fastest air-breathing manned aircraft. The place flaunts effortless elegance and allows the hues and history of the building to do the talking. 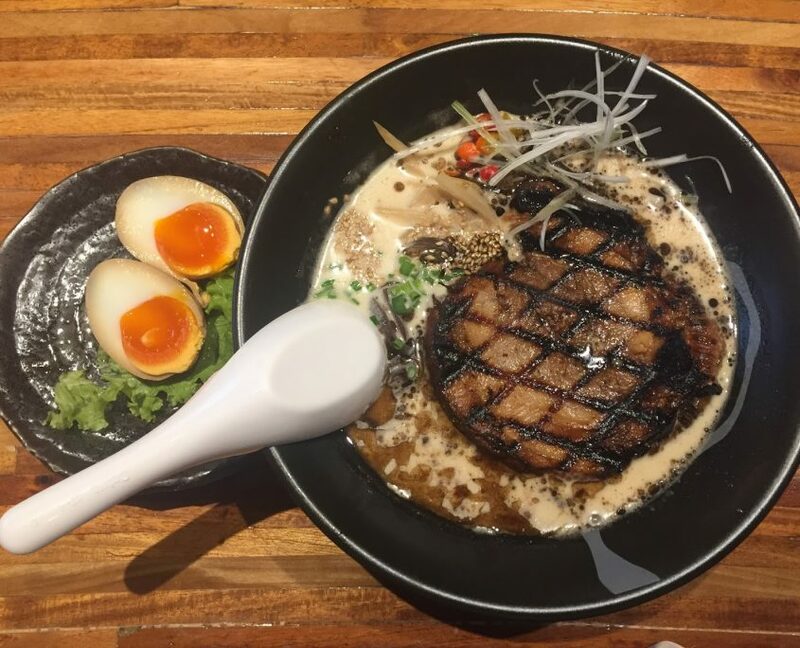 Their eclectic menus (day and night) combine world-class classics with contemporary Asian cooking. One of the more popular dishes at Blackbird is the Pappardelle, fresh pasta cooked to a lovely bite, adorned with shards of Parmesan, rosemary chili crumbs and arugula. 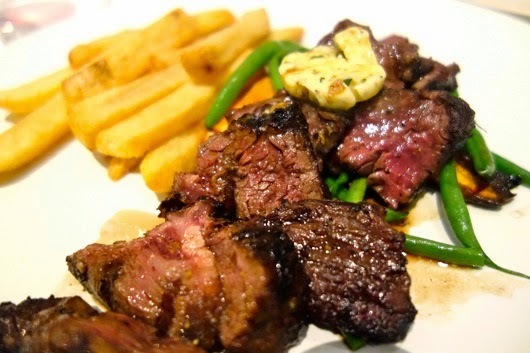 Another is the dry rubbed Wagyu hanger steak, drenched in deep-flavored sauce, and paired with thick-cut potato fries. Coffee lovers, rejoice! 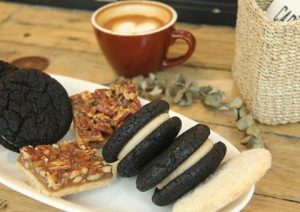 Here is where you’ll find a more handcrafted approach to brews and a convivial atmosphere made for coffee conversation. From Espresso and Macchiato to Piccolo and Cappuccino, name any blend of coffee and they have it. But it’s their signature blends, like the Flat White and Long Black that have people coming back. 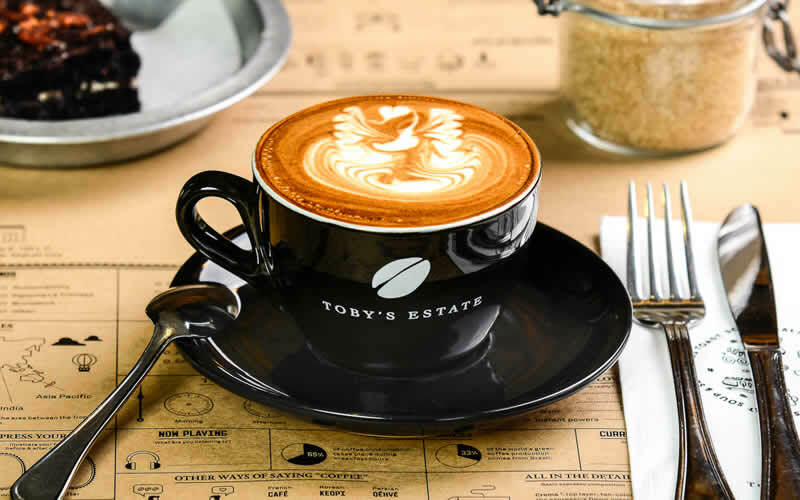 Toby’s Estate also boasts of yummy eats and pastries such as the Bucky’s (brownies) and Travita (baked eggs with tomato compote and crushed cherry tomatoes). Snugged perfectly amidst the idyll Salcedo Village is Cartel Deli, a Spanish-Filipino Coffee bar and Deli. This one-stop shop that offers deli goods, pastries, coffee, salads, sandwiches, and wine is slowly becoming a hangout for nearby office-dwellers and a grab-and-go stop for residents at the same time. Get your fill of scrumptious sandwiches such as the Italiano sandwich that overwhelms with the freshness of arugula, a welcome crisp taste that balances out the salty salami and rich cheese, or the Grilled Three Cheese sandwich which is a twist on the childhood classic. As for coffee addicts, you can seek your caffeine fix via Yardstick, whose brews are used to create the coffee served at Cartel. It’s three o’ clock in the afternoon and you’re looking for a house of snacks and desserts that’s near your office. We say drop by Banapple, a bakery café that also has a delicious selection of full meals. 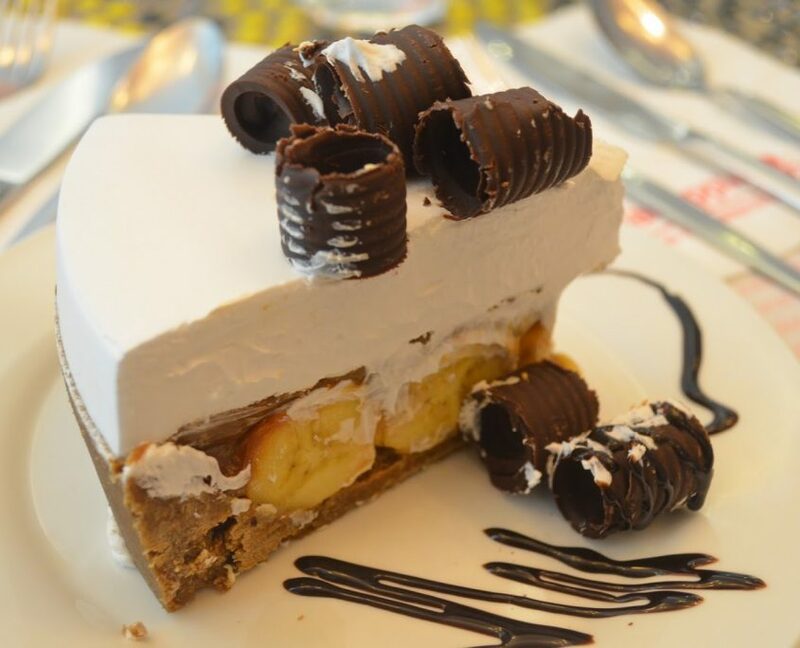 A bite of their banoffee pie will make your taste buds tingle with delight because of the two layers of dulce de leche with slices of banana and graham crackers garnished with dark chocolate drizzle. 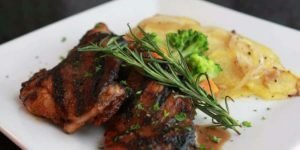 As for meals, Banapple serves them home-cooked style and hot like the well-loved chicken parmigiano, lasagna roll-ups and hickory-smoked country ribs. Mmmm….donuts! 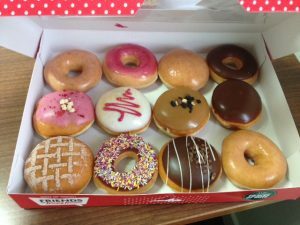 Who else but Homer Simpson comes to mind when doughnuts are mentioned. Glazed Chocolate Cake, Powdered Strawberry Kreme, Sea Salt Caramel, Mint Chocolate, and countless more yummy flavors await your gluttonous appetite. So go ahead, satisfy your craving for straight-up sugary deliciousness with a bite (or a box) of Krispy Kreme Doughnuts. Cowabunga! It’s Michaelango’s fave food (we’re talking TMNT here, not the famous Italian artist). Who doesn’t love pizza? 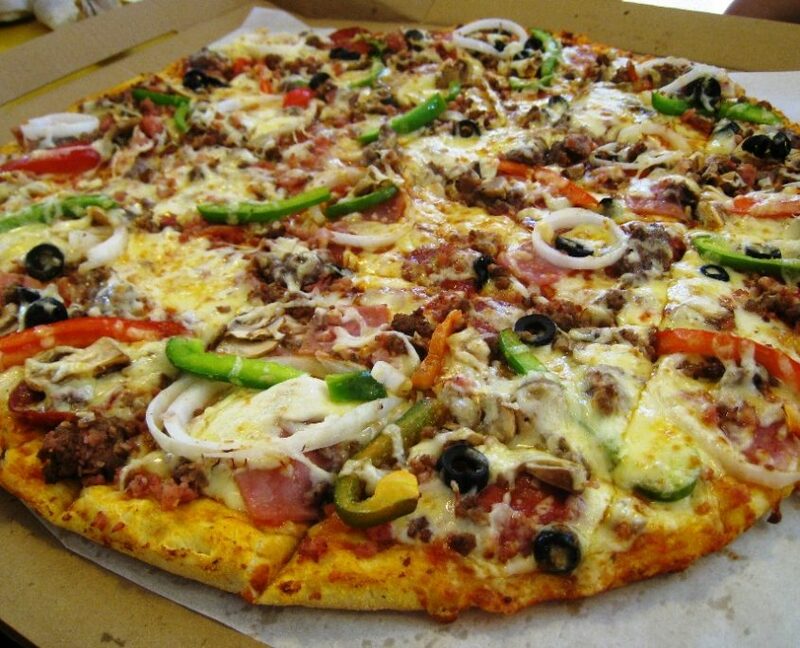 You can’t just have one, it’s impossible, especially with Yellow Cab. They create pizza so good the smell of it drives even the health conscious to forget their diet and dig in. Yellow Cab also offers pasta, potato wedges, and chicken. Totally drool-worthy. After a long day, it’s nice to unwind with your officemates, or if you’re lucky, your boss. The bar is named after Bugsy Siegel, a famous American mobster in the 1930s, which explains the look and feel of the place. With its big chandeliers, the black and white photos on the wall and the deep red upholstery, Bugsy’s Bar & Bistro resembles a stylish diner of America’s gangster era. They serve Western-style, American and Mexican food – salads, burgers, burritos, etc. – with a Filipino twist. As for the drinks, there are plenty to choose from. A fit body leads to a fit mind. Be in the best shape you can be or take away the stress of the day in this fitness gym and dance studio in the city. Circuit training gives a more fun approach to burning those calories plus, you’ll get to meet new people and maybe make new friends in the process. The best part is, FTX Gym has no joining fee or any membership fee that’s the usual gym’s users burden among big fitness clubs today. Now you’ve got no excuse to break a sweat. The location of an office isn’t only for the business’ or client’s benefit, but also for its employees. They need a work-life balance in order to be productive every single work day. When employees are surrounded with places that connect to them or elicit their interest, they have something to look forward to other than work. This is why you can see employees of Arch Offices wearing smiles throughout the day. Want an office space in Paseo de Roxas, Makati City? Contact us now and we’ll help you move-in to ARCH OFFICES.